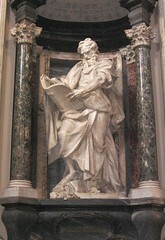 Today is the feast day of St. Matthew- apostle and the first gospel writer. 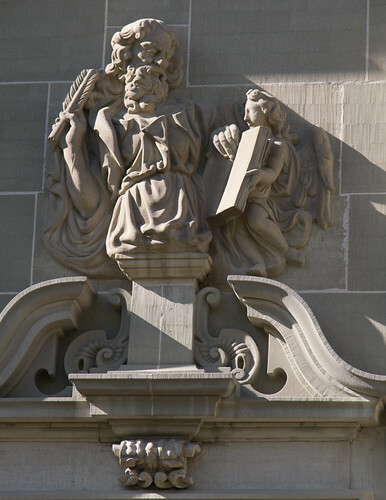 St. Matthew (also known as Levi) was the son of Alphaeus and worked as a tax collector. He was reviled for his work since tax collectors worked for Rome and were known for cheating the people and profiting from the collections. This is probably why his shield displays three purses - three for the Trinity and then, of course, the purses represent money collection. It is St. Matthew who had the dinner for Jesus with the Pharisees and other sinners, for whom Jesus said, "I have not come to call the righteous, but the sinners." The Gospel of Matthew was written in Aramaic- the Jewish language at the time and was written for a Jewish audience. After the ascension, Mathew is said to have gone to Ethiopia where he was beheaded. 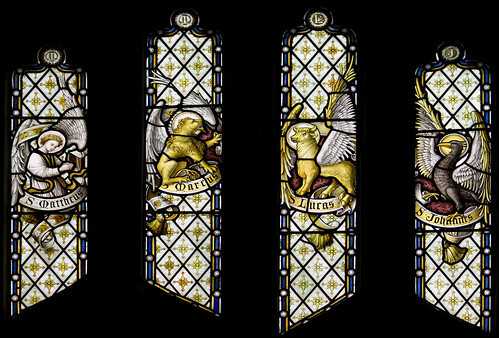 In Christian Art, Matthew is usually depicted with the winged man or angel. Father Lawrence Lew, OP, via FLickr, licensed cc. Free Bible Study on the book of Matthew here. Put gold chocolate coins or kisses in a bowl today to symbolize Matthew's conversion from tax collector to disciple! Watch Jesus of Nazareth which is heavily based on Mathew's Gospel. At 2:10:02 is one of the funniest parts of this movie- Peter expressing his feelings about St. Matthew and then putting a little sarcasm towards Jesus - makes me laugh every time. You can see the entire movie online for free on Youtube here.